Over the next six weeks, I will be re-designing a space in our home, and sharing every little detail of the process right here. If you haven’t heard of the One Room Challenge before, it is a bi-annual event hosted by Linda at Calling it Home featuring 20 bloggers as they renovate a single room in their home. Every Wednesday the 20 featured bloggers showcase their progress and the following day, Guest Participants are welcome to join in the fun. In the past I’ve renovated our Powder Room (that one went viral!) and our Basement. Having a set timeline in which to get everything done can be stressful – but it’s also a great push to complete a room from start to finish that might otherwise take months to complete as I nit pick over every tiny detail. If you are visiting for the first time, thank you for stopping by! My name is Jenna and this blog is where I share my love of home decor and DIY projects. I’m a wife to Brian and a Mummy to two wonderful boys aged (almost) 3 and 6 months. I’m originally from Ireland but moved to Boston 7 years ago. We now reside in the suburbs and moved into our 1960s Colonial in December 2015. Since then, we’ve been renovating the heck out of it! You can see all the before + afters here. We’ve been super busy with our backyard reno (which I’ll be sharing soon) and dining room refresh but now it’s the turn of our PINK bathroom. Yup, we are the lucky owners of one very pink bathroom. Beautiful isn’t it? 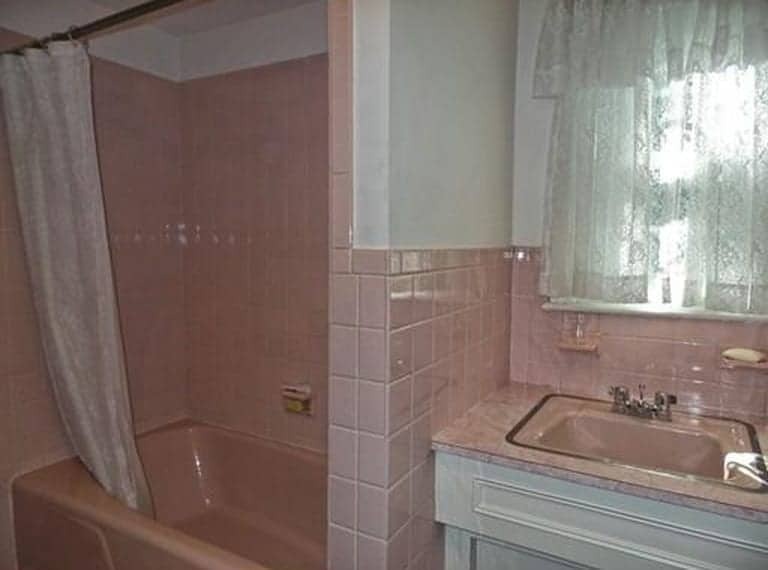 Maybe you’re into the retro pink bathroom thing but it really doesn’t fit in with the overall aesthetic of the other spaces in my home. Plus, it always feel grimy in here! Originally Brian and I had discussed completely reconfiguring this space and it is pretty awkward but that would involve eating into the baby’s already small bedroom. Right now there’s a window over the sink that prohibits any sort of mirror. To the left is an alcove with the bathtub. Unfortunately that is a non-standard 57 in length (nowadays tubs are usually 60 inches) so replacing it out of the question. This means we have two options – get a custom fit acrylic liner or have the tub reglazed. Stay tuned to see which option we ultimately decide on! The second issue is aforementioned window over the sink. It has to go and the only other place it can be moved to is inside the bath alcove. Not ideal but I’m thinking a 12 x 48 window should allow enough light in while still maintaining privacy. 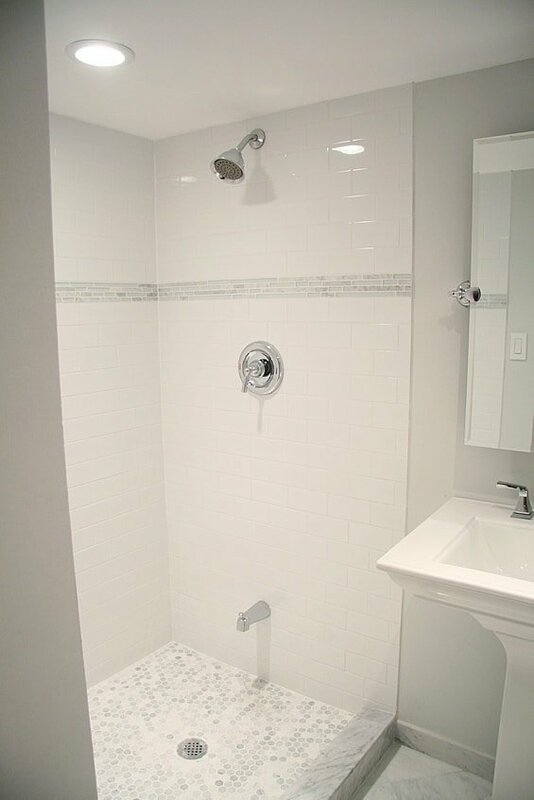 My initial thoughts were glossy white subway tile with a marble shampoo niche and gray floor tile. I wanted to complement that with a white or gray vanity with a marble top. BUT, Brian wanted to add a slightly more masculine touch to the space since I don’t use it as much as he does. I think the weathered wood will be a beautiful touch to the space and will contrast really well with the cooler whites and grays. Now it’s time for me to put my thinking cap on and fully think through what we’re doing with this space – – there’s so many little details to figure out! Demo begins tomorrow, I’ll keep you updated via my Instagram stories so make sure you’re following me! I’m so excited for this process and hope that you’ll check in every Thursday for the latest updates! We just sold a house that had this exact bathroom tile including the floor! I wanted to redo it so badly. We did redo the master that was a mint green copy of the pink. It was so much work, but turned out so great. Can’t wait to see what you do. How fun! Have you ever seen this website? http://savethepinkbathrooms.com/ I get a kick out of it. Even if pink isn’t your style, it’s a fun little look back in time. Good luck with your project! Oh my gosh! My childhood home had this same bathroom. Can’t wait to see how it turns out. Love the plan you have for the space. Here’s a crazy idea: what about hinging a mirror to your over-the-sink window — open for light and ventilation, closed for shaving/brushing/primping??? 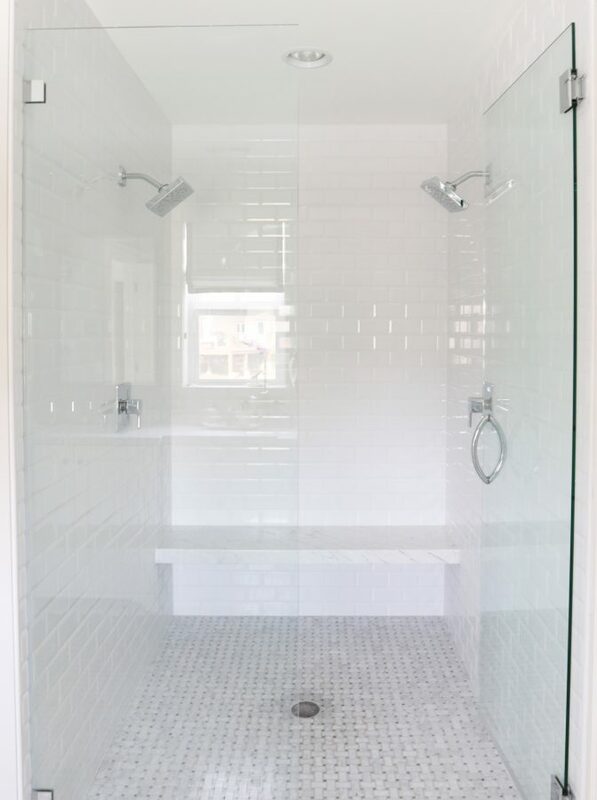 Putting a window in a shower bath is never a good idea and you’d also have to deal with the exterior of the house and a building permit. We did consider that but ultimately it’s not a look we personally like. While I would rather not have a window in the bath alcove, it will actually considerably brighten up the room due to the fact that it’s a 14 x 48 window. We’ve already got the permit ready to go and our contractor will be installing the new window next week! It all looks so lovely and I can’t wait to see it when completed! Good Luck! Very interested in your vanity choice. I’m going to be looking for something similar for our hall bath! good luck! I can’t wait to see your transformation. Our current master has tile so similar to this. My plan is to redo it for the Spring One Room Challenge. I am excited to follow along! It’s going to be so pretty!! And we’ll be watching closely for inspiration…Laura Peacock has the EXACT same pink bathroom in her house! Gotta love the 50’s! ~Laura Irion/ Laura Design Co.